Then, between those two premises, we're left to think about how we find some way to both restore the WS back to a place where ALL teams come to that series having had EXACTLY the same rule book... and... do that without disrespecting either the 65% or the 25%. Somewhat obviously, a compromise has to be found. (C) And with regard to compromise, a fundamental guideline there is that anything that strays away from the form of the game that people already know is something that inherently makes everyone have to form a whole new opinion about that new form of the game. I have counted about 25 different compromise rules proposed in the 12-ish years that I've been paying specific attention to the DH dilemma. I've said on many occasions, if it were just up to me, I favor the Duck Hunter. There's more to it than this, but essentially the idea is that DHs mainly come to bat in the P slot when there are ducks on the pond. Someone else favors the Super PH. Someone else favors what has been called the "bodyguard" model. Then there is the wedge idea... the SIR (substitution induces reassignment) idea... the descending DH idea. In every case, you end up with traditional people happier than the DH people or vice-versa, because the compromise seems to end up giving more weight to their preference. But, at least, EVERYONE has to give up A LITTLE SOMETHING, which is still more respectful than forcing one side to give up EVERYthing. So that's why you see me positing that as I have in recent memory, instead of giving you all the great reasons the Duck Hunter compromise rule would make everyone happy and the game better. 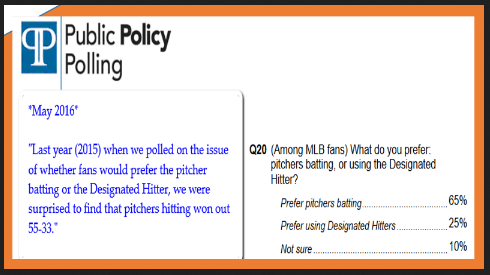 It is simpler than other compromise rules, and it has precedent--i.e., it is the original idea that they came up with to deal with the natural dilemma during spring training interleague games, and it continues to be that way today. We appear to have some time here to influence Manfred and the MLB owners to do something rational like this, instead of a binary choice. I for one intend to take advantage whenever and wherever I can to advocate for HMC. I don't get the argument that fans don't want to "see the pitcher hit". Of course we don't, but you could watch the pitcher he's facing, PITCH! I don't want to see the 3rd lefty in your bullpen pitch either. I don't want to see David Ortiz play first base. There are a lot of situations in baseball we don't want to see. That's part of it. There are a lot of situations in baseball we don't want to see. That's part of it. That would be a great slogan for MLB. Going to be looking for some baseball fans willing to be signatories to a letter that goes out to MLB aristocracy--the owners, and MLB execs, including of course Manfred. Additionally, a separate letter will be prepared to go out to MiLB commissioners and franchise owners. 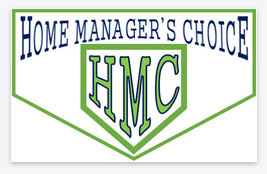 In both letters, the case will be made to respectfully unify baseball through adoption of home manager's choice. Special to the MiLB letter, we will ask them to consider adopting HMC for next season, cognizant that many changes that ever occur in baseball get tested first at a minor league level. But more that just signatories, we also need one-paragraph biosketches of each fan with contact information that effectively legitimizes each person's credentials as a baseball fan, and would allow those receiving the letter to confirm that we are all real people, not just names harvested off of some tombstones. If you would be open to that please see the sign-up list at the Respectfully Unify Baseball page on Facebook. Of these ideas presented, I would almost support the Duck Hunter model, if both leagues used it and that left room for pitchers to hit during the rest of the game. This model would need to allow DHs to do their Duck Hunting with runners on 2nd and 3rd, but force pitchers to hit with any number of outs and a runner limited to first base only. In those spots, pitchers could still pursue contact hitting, an occasional bunt, and stay in the game for a few more decisions on their record. Most importantly, it would force managers to lift their pitcher for the right reason, in both leagues..... that a different pitcher is necessary because the starter/reliever is tiring. Strategy is back in use and on a level field. Bunting does the very least of adding spice and variety to the action on the field. This is an option I have never heard before, and I actually like it (a little bit). Something came to mind recently over the rumored prospects of a strike in the year 2021 when the current labor agreement runs out. This will not be a popular choice among many fans, but it is consistent with where I stood in 1994 and even in 1981. This stance remains unwavered. I must side with owners, yes the owners. Everyone in our economy is working for a greedy scumbag, and 'he who has the gold makes the rules'. This is a fact of the landscape for each of us. It just might be the only fact left which I might have in common with Arod 10 years ago, Albert Pujols or Manny or Bryce in the future. So, you're getting a raw deal, then join the club. Recognizing the lost cause that the DH has become as a tool for creating jobs among ballplayers, and that there just be a strike from these pampered pinheads, I would entertain a compromise. So, could it be that the ultimate resolution on the DH would result from a strike settlement? Owners would surely remember how the popularity of baseball suffered in 1981 and especially in 1994, and need to spice up the game with something. I'd love to talk about Duck Hunter over a couple of beers... well, actually, my dad was an alcoholic, so I've never drank, so diet Coke here... and I don't mind direct messaging you with the details. I'm hesitant to post that here because, now that Manfred's went public with his inclinations, the clock has begun ticking and this has reached such an acute stage. So, I fear that all talk of other compromise rules would be distractions from getting something done that we ALL felt we could live with. The other compromise rules are always going to be judged, and appropriately so, on the (a) unintended consequences that would result and (b) degree to which the outcome would be more weighted toward the DH game or the traditional game. Thus, HMC, while not my favorite, is the one that I believe can legitimately gain traction, and be implemented. In fact, because it does not substantively change anything other than how the use of the DH for a given game is decided, I could be wrong, but I'm inclined to believe the current union agreement could be interpreted to accommodate it. But regardless, because it is so simple and uncomplicated, and because there is spring training precedent for it, and because it basically just takes the decision out of the hands of the execs in suits, and puts it in the hands of the individual home managers in uniform from game to game... I think all of us who connected to the game can feel better about it than forcing either the 65% or the 25% to forevermore and universally accept the form of the game they do not favor. Last edited by _sturt_; 02-23-2019, 11:17 AM. The same could be said of basketball with free throws and excessive replays. Football has extra points and excessive replays. There is downtime in every sport. I don't think a pitcher hitting is some outlier boring event. Apples and oranges. If the Eastern Conference (or the AFC) had figured out a way to avoid those problems while the other half of those leagues obdurately refused to adopt them, then that analogy would hold. Sorry, I cannot do rational with this. I just want the DH. Once again, a smaller roster size (21 man) could help fix this, combined with eliminating the DH. Smaller rosters mean pitchers have to go more innings. This also means that they have to manage their efforts and may chose not to blow away the opposing pitcher with their grade A stuff. Also means that we would likely get some real two way players with 5th starters and 4th relievers getting replaced with guys who might actually be able to pitch and hit a little. As said previously, we all have our reasons for strongly preferring the DH or the no-DH game, many of them fairly rational. But this is just proposing that we take a respectful view, and instead of working against each other's form of the game, coming together to ensure that no one's form of the game is obliterated for the rest of baseball history... but to the contrary, we all work cooperatively toward a compromise that allows both to co-exist under HMC.